Hance Major Embleton was born to David and Emma Embleton on 28 February 1895. On the 1911 census Hance is one of eleven children living at home in Victoria Street, Sacriston. Aged 16, he is working as a putter below ground in the mines, along with his older brother John. His 14 year old brother Henry is a pony driver, and their father is a hewer. In June 1913, aged 18, Hance enlisted as a private with the territorial army, joining 8th battalion Durham Light Infantry (DLI). On his enlistment papers, and other surviving military records, his name is spelt Hans Embleton. It was during the annual training camp of 1914, taking place in Conway, Wales, that war was declared. The battalion returned to Durham and began training, first in camp at Ravensworth Castle, then in billets in Gateshead. On 19 April 1915, 8 DLI left Newcastle for Folkestone. From there they sailed to Boulogne and spent the next few days making their way across France and Belgium towards Ypres. All the DLI territorial battalions made this trip within a few days of each other. On 24 April, the battalion marched through Ypres, arriving at their destination of Boetleers Farm in the early hours of the next morning. Over 25-26 April, 8 DLI was involved in heavy fighting alongside Canadian troops. Half the battalion was reported as killed, wounded, or missing. The missing included those captured by the Germans and taken prisoner of war. Private Hance Embleton was in this last category. At first he was sent to Munster II prisoner of war camp, also known as Rennbahn. From Munster II, Hance was sent to a working camp where he worked in mining, and on coke ovens. He would return to the main camp to collect letters and receive his food parcel. According to the prisoner of war records of the International Red Cross, by February 1918, Hance was 300 miles away at a camp in Chemnitz. His Uncle John was also serving with 8 DLI and taken prisoner of war. Although they were both at Munster II, they were sent to different working camps, and didn’t see each other until they had returned home. For Hance, this was in December 1918. Hance’s older brother John served with the Royal Field Artillery during the war, but was discharged in 1919 with pleurisy (inflammation of the lungs). In 1920, Hance Embleton married Jane Archer (nee Dodds), whose first husband had been killed in action in 1915. Hance and Jane had several children together, including twins that didn’t survive in 1925. Sadly, the following year, Jane also passed away. Hance struggled to get over the loss of his wife, and moved down to his sister Jessie in London, where he remained during the Second World War. During this time, he worked on the roads and served as an Air Raid Warden. The 1939 register shows Hance living with the Clements family in Hendon, Middlesex, a few miles from his sister Jessie. Hance’s son David is listed in Jessie’s household. At some point, Hance moved to live with his daughter Jane and her family. Here, he shared stories of mining in Sacriston, and of his time in the war, with his grandson, who still considers him his hero to this day. 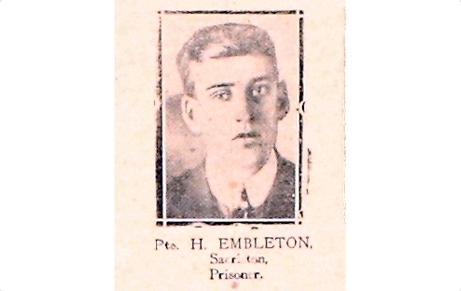 Hance Embleton died in 1973 in a care home in Towcester, Northamptonshire.